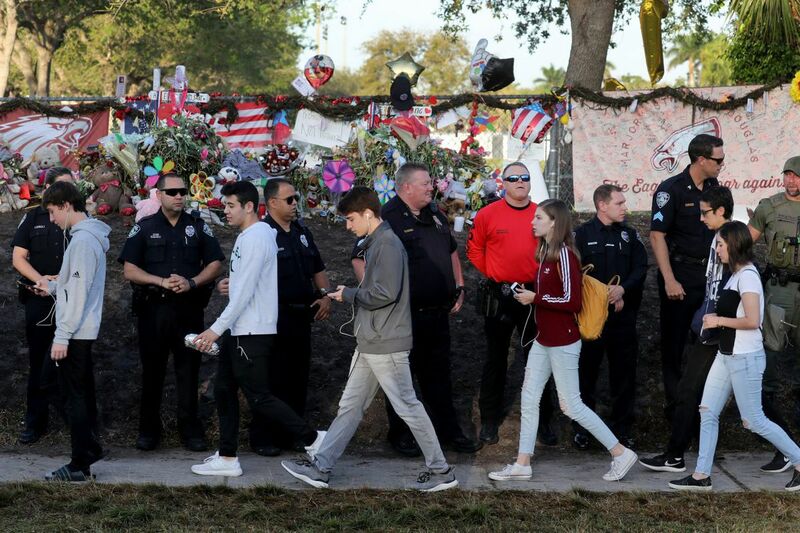 Students head back to school at Marjory Stoneman Douglas High School for the first time after a gunman killed 17 students in the school on Valentine’s Day on Wednesday, Feb. 28, 2018 in Parkland, Fla. The recent school shooting in Florida continues an unsettling trend of assaults on students in their neighborhood schools. While the debate will continue at the national level on proposals for arming teachers and "hardening" our schools, in Pennsylvania there are tangible, less polarizing steps we can take right now to make our buildings safer. One of the largest concerns regarding school safety in Pennsylvania is the age of our schools. More than 65 percent of schools in Pennsylvania were built before 1970, according to a 2014 study commissioned by the state Department of Education. That's before the energy crisis, before computer technology, and certainly before active-shooter drills became part of our students' lives. Many of these buildings have been renovated over time to upgrade their services, educational opportunities, and safeguards. But far too many have not. While establishing an emergency management plan is the first step in a school's safety program, the configuration of the building and its security infrastructure is also crucial. As school architects, we have walked through numerous facilities that do not have even the most basic safety measures. Examples include administration offices remotely located from unmonitored school entrances, exterior doors that lead directly into classrooms, classrooms unable to be properly locked down, and a lack of security cameras both on the campus and inside the building. Over the nearly 20 years since the Columbine tragedy, school security equipment and protocols have evolved considerably, and architects have responded by developing best-practices for the design of resilient, secure facilities that not only protect our students but help them thrive. An appropriate campus configuration optimizes visibility at access points and establishes alternative entry points for first responders. Durable materials such as masonry and reinforced glass at potential breaching locations reduces intruder accessibility. The use of laminated glass with blinds and full window screens or shades infuses natural light into spaces without sacrificing security. A locked vestibule at the main entrance forces all visitors to be formally screened before gaining access. Dual purpose safe rooms can be utilized for everyday group work as well as shelter-in-place situations. A strong, solid door and a robust locking system secures classrooms from an intruder. Security cameras provide real-time video to district administrators and police. A building-wide communications system allows faculty members to broadcast a security threat from any location in the building. While the strategies enumerated above are paramount in 21st-century schools, it's critical that we also keep school buildings' primary function at the forefront. While we must continue to explore new security strategies, we must equally strive to develop warm, welcoming environments that foster cognitive growth, intellectual curiosity, and social development. As stewards of the health, safety, and welfare of the public, architects can lead this charge. Beginning in 2016, AIA Pennsylvania, part of the American Institute of Architects, launched a series of public forums designed to bring together experts in the field of school construction, including state legislators, school superintendents, general contractors, and architects. These forums were initially intended to support the reform of PlanCon, a state-run reimbursement mechanism for local school construction. While the forums continue to engage the public and our legislators on the complex facets of school construction in the commonwealth, there is currently a moratorium on PlanCon funding. AIA Pennsylvania will continue its ongoing dialogue with state legislators, the Department of Education, Gov. Wolf, and local school districts to find workable solutions to safeguard our schoolchildren. We urge our state government to continue its long-held practice of contributing to major school renovation and new construction projects to help our local communities provide safe, secure, and educationally dynamic environments for our children. Scott J. Compton, AIA, NCARB, LEED AP is the president of the unifying body of the Pennsylvania Chapters of the American Institute of Architects. Michael Kelly, AIA, LEED AP is vice chair of the AIA Pennsylvania Education/School Construction Subcommittee.